Big Lazy Chop or “Da Lan Pai” might seem like your average zi char restaurant with its large open-air seating area and extensive Chinese menu, but look a little closer and you’ll find a few gems that are unlike any dish from your regular zi char haunt. 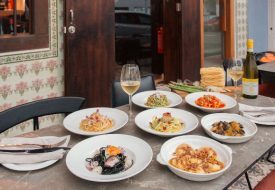 The name of the restaurant harkens back to the good old days where people gathered around the table to enjoy great food at a leisurely pace. Be serenaded by Chinese songs from famed songstresses of yesteryear as you enjoy your meal in a cosy bistro environment. 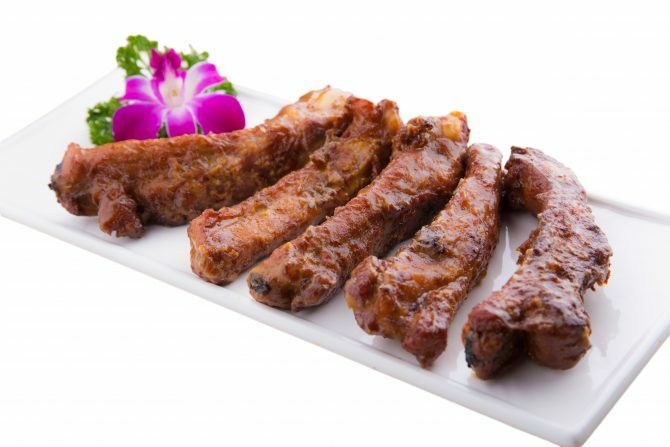 20-cm long pork ribs that come in a variety of sauces, you’ll want to try them all. Helmed by Singaporean chef Oh Ah Lek, Big Lazy Chop stays true to its local roots by coating dishes with familiar sauces like salted egg yolk, chilli and curry. However, chef Oh also likes to push the boundaries by mixing different ingredients to create his sauces. Currently, there are nearly 30 types of sauces available. 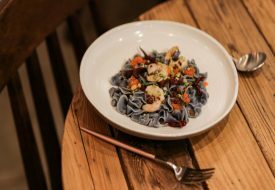 To showcase this wide variety, the menu is designed to match the key ingredient with different sauces so that diners can try a different pairing each time they visit. The XL Spare Ribs ($20+) is one of the dishes that highlight the bistro’s various sauces. The Spare Ribs are such a signature here that the “Chop” in the restaurant’s name is named after it. Each Spare Rib is about 20-cm long and you can have it with tried and true favourites like Salted Egg and Coffee sauce or you can be more adventurous and try their Drunken XL Spare Ribs. I especially loved the Butter Champagne ribs that had a tinge of acidity from the champagne to cut through the fattiness of the ribs. These money bags are made with delicate egg white skin and stuffed with crabmeat. Start your meal with a Handmade Crab Slice Money Bag ($18+). Each money bag is made fresh daily and they only have 21 dumplings available each day. 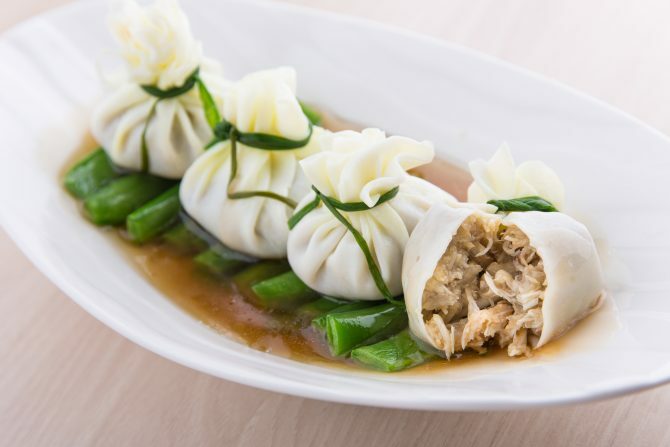 What sets it apart is the use of egg white to make the skin of the dumpling, creating an incredibly light package that delivers slivers of fresh crab meat and flavourful seafood sauce to the mouth. No visit would be complete without trying their XL Sri Lankan Crabs ($70+/kg) either. 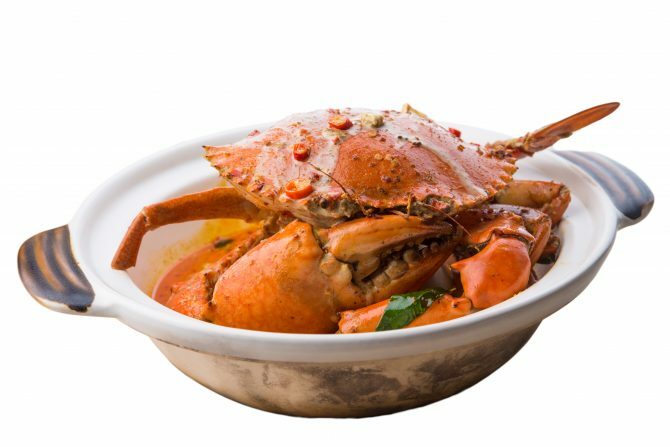 There are five different styles in which you can have your crab — Indo Curry, Black Pepper, Salted Egg, Chilli or with Bee Hoon. Out of the five, I recommend trying the milky yet spicy Indo Curry sauce that has been a signature of Chef Oh for 26 years. The curry is made with four types of chillies, lemongrass and curry leaves, and is then wok-fried for an hour to release the fragrance of the spices. The curry packs some serious heat but goes together perfectly with some fried man tou to soak up the delicious goodness of the curry sauce. If that’s still not enough, end your meal with Fried Chestnut Bars (for 2 to 3, $8+). The sweet and sticky mixture is so much better than a fried Mars Bar. The lightweight chestnut concoction melts in your mouth once you bite through the crispy exterior, my only wish is that they would serve it with some vanilla ice cream too. Instead of the usual chilli crab, why not try Chef Oh’s signature Indo curry crab? With so many sauces and dishes on the menu, diners are spoiled for choice when they head over to Big Lazy Chop. If you don’t feel like sharing, the bistro also has a great value set lunch from $9.90 where you can have your choice of protein with one of their signature sauces. 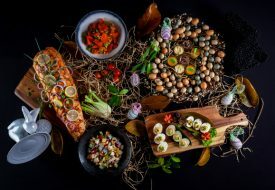 This humble eatery is definitely a treasure trove of gastronomic finds that will change the way you see local food. Big Lazy Chop. #01-04, 1A Short St, Singapore 188210.